Water heaters are quite an important household item. During winter it is practically impossible to use cold water for showers if your water heater is not in working. Because of frequent use, water heaters are prone to damage over time and only good repair services can sort this potentially costly situation. Water heater repairs are very important as they help in cutting the costs involved in buying and installation of a new water heater. There are good companies that can help with water heater repairs. Here are the key signs that indicate that you need to repair or replace your water heater immediately. Your Water Heater Creates an Annoying Sound: A water heater that pops, bangs or cracks whenever it is switched on indicates that it may have an issue. If you always hear these types of noises, it clearly indicates that your heater needs to be repaired. In many cases, a constant noise indicates there is a sign of mineral buildup or a forthcoming failure of the heating element. If this problem is recurrent then this issue needs to be rectified. Get in touch with a water repair company in Brooklyn who can either repair or replace your heater. Cold Water Coming Out of the Shower: If cold water comes out consistently then it clearly indicates that water heater needs to be repaired and is not in working condition. You may also notice that the water coming from the shower is not at all hot the way it used to be, which indicates that the equipment has already started working improperly and there is the drop in the temperature of water. Dirty Water Coming from the Shower: If brown or rusty water with a strange metallic taste comes out from the shower this is a clear indication that there is a water heater failure. If dirty water is inside the water heater tank then it also indicates its malfunctioning. This may be resolved with a cleaning or may require replacement if the unit is rusting. Water Present on the Floor Around the Tank: If you ever see a pool of water around your heater unit this is another clear indicator. If there are puddles on the floor around the tank clearly shows that there is corrosion inside the water tank. In such a scenario it is always advised to immediately call a nearby plumber in New York City. Usually the life of a water heater is around 8 to 12 years. This duration can be even shorter or longer it all depends on the frequency of its usage and also the number of daily users. 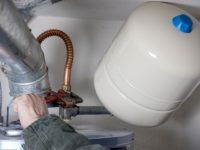 In any case, if you feel your water heater is not in working condition so do not waste time just get in touch with C James Plumbing & Heating Inc. a renowned Water Heater Repair Company in Brooklyn, New York.